A Beautiful Ruckus: Essential Oils: Do they really work or is it all just hype? 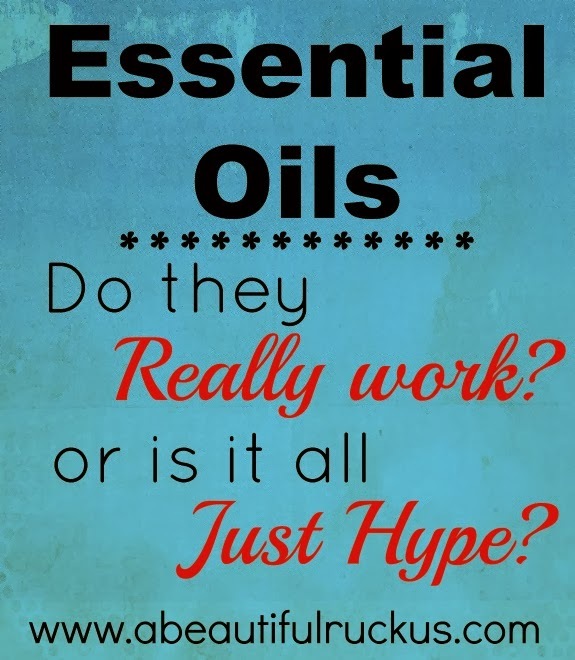 Essential Oils: Do they really work or is it all just hype? I've been spending a lot of time lately researching something that is entirely foreign to my way of thinking. I've been asking all sorts of questions beginning with, "Do they even work? Or is it a bunch of hype?" I'm a big fan of modern medicine. Big fan! With four little preemies that needed intense intervention to survive (like a ventilator), I put great stock in the research and strides that the medical community continues to make. I'll never be one who tosses all of that out the window. I'm also a strong proponent of vaccines. Everyone has a pet peeve. Un-vaccinated children is mine. Don't even get me started on that. But more and more, I've been wondering about essential oils. I mean, there has to be something to them with how long they have been in use, right? I wouldn't go so far as to treat appendicitis with them (because that’s seriously crazy)....but there might be an aspect of these oils worth looking into. Here is the problem: As much as I appreciate modern medicine, I really don’t like having to use it. My quadruplets are two (almost 3! ), and with their little, fragile immune systems, we are in a constant state of fight to stay well. While I love having our modern meds to fall back on, it would be nice if we just stayed well in the first place. That’s a TALL order for my kids who are cootie magnets. I just feel like I need something else to support their immune systems. I’m at a point where I feel like I would try anything just to have a break from the human condition. Does that sound overly dramatic? Ha! If only I was joking about how hard it is to keep these kids well! So I've started to dive into the world of essential oils. What are they? How do they work? What is the science behind them? Which is the best one? Is it worth the money? I have to tell you, there is an INSANE amount of information out there, and a good chunk of it is contradictory. I did find two resources that I've enjoyed at length though. This seven-part series on which essential oil companies are the best and this video about the science behind essential oils. I like having facts substantiated with science, and unfortunately, not many scientific studies exist about them since they aren't highly monitored. It seems, each essential oil user has to do their own research about what makes up a pure oil and then decide which company they think is best. So much for my need for everything to be black and white. If you think I have answers....sorry. I research stuff like this to death before making a move on it. Can you blame me? This is my family's health we are talking about! Hmm...I waver back and forth several times a day about whether or not to give it a try. Right now, I'm leaning toward trying it. But then my mind says, "You just rub a little oil on and you're magically better." (My mind likes to simplify things.) Is it too good to be true? I hope not. I'd love to hear if you have any experience with essential oils. Did they work for you? Or not? And which companies do you recommend, and which should I avoid? As my hubby put it last night, "It's a bit granola-y for me." Me too, Babe. In fact, I can't believe I'm even entertaining the idea. But I once said that about chiropractic care, and now I see - and enjoy! - the benefits of that. So...I guess I figure essential oils are worth looking into. Note: Due to FDA Regulations regarding the ability to share personal testimonies regarding essential oils, all comments have been deleted and future comments have been turned off on this post. There were so many comments and too many fabulous stories being shared in the comment section to remain in compliance. Thanks for understanding that I’m trying to stay on this side of the law! Seriously? That stinks...no comments! Was really looking forward to reading them.